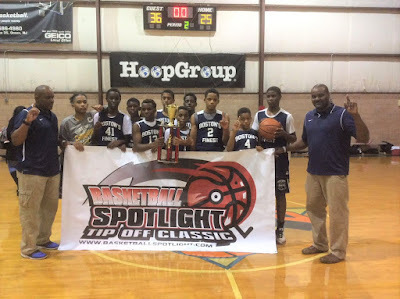 BASKETBALL SPOTLIGHT NEWS: Basketball Spotlight Tip Off Classic 7th Grade Blue Division Championship Recap: Boston Finest Shines! Basketball Spotlight Tip Off Classic 7th Grade Blue Division Championship Recap: Boston Finest Shines! Jonathan Guerrier scored 16 points and Damien Alvarez added 9 markers as Boston Finest defeated Playtime Panthers 36-25 to win the Basketball Spotlight Tip Off Classic 7th Grade Blue Division Championship. Playtime Panthers had balanced scoring in the loss. Boston Finest coach Eddie Simpkins talked about his Spotlight experience. “It was an accomplishment for the kids to win the chip at the SPOTLIGHT. They worked hard to achieve the goal and we have some great future stars in our young program. We would like thank Mike Melton and his staff for a great tournament and it’s highly recommended” he finished.